Our focus this Lent is about renewing ourselves in Christ, and strengthening our family and community by bringing them closer to Christ. For this reason we are using the 23rd Psalm at all the Sunday Masses as a reminder the we need to cling to Jesus the Good Shepherd. 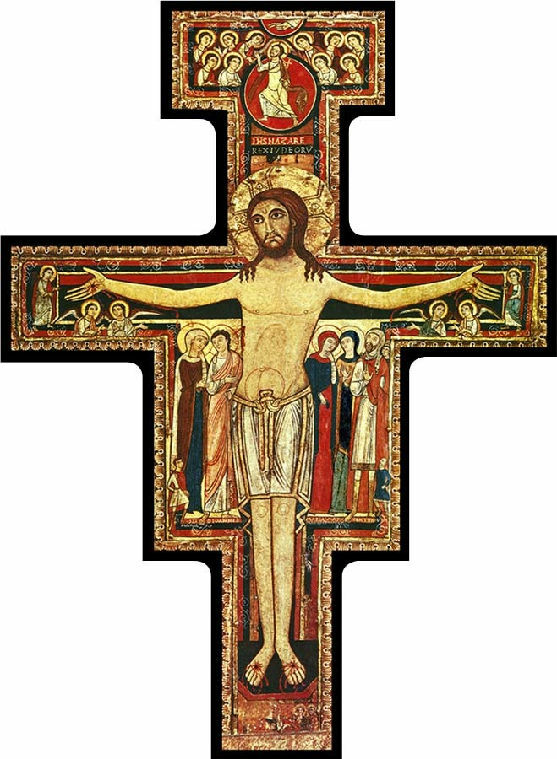 The processional cross is a copy of the San Damiano cross. One day when St. Francis was praying in front of the San Damiano cross, he heard God tell him “Go, Francis, and repair my Church which, as you see, is falling into ruin.” At first St. Francis thought God wanted him to physically rebuild His church, but would come to realize God meant to spiritually rebuild His Church. The Church of 1205 was falling into ruin. St. Francis started his journey by understanding his need to surrender to Christ. After deepening his life with Jesus, his focus was to help others find Christ, especially the poor and needy. Others began to follow his lead and the Church and community began to grow and prosper. The purpose of this Lent is to renew the Church by renewing our relationship as the beloved sons and daughters of God. In this love relationship, we, like St. Francis, will fall in love with all of creation, all of God’s children. In serving them we serve Jesus. Also in this love relationship we will find the strength to transform our lives with Christ assistance. May Almighty God enable us to be a guiding light for each other and a source of hope for all those who are struggling.